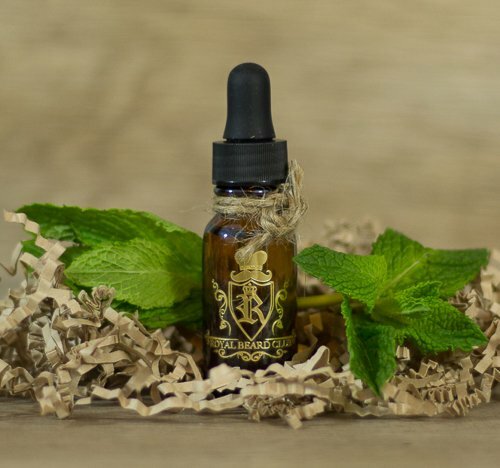 If you are looking for a beard oil to keep your beard and skin in good condition, if you want that oil to be minty and fresh, then Royal Beard Club ‘Royal Mint’ Beard Oil is what you are after! As soon as I dropped some of the ‘Royal Mint’ Beard oil from Royal Beard Club into my palm, the scent was so familiar. Now of course mint will always be familiar but this reminded me of Christmas, every year we buy the ‘After Eight’ chocolate wafer mints and this oil reminded me of the minty centre inside. What makes this oil so fresh smelling is the addition of Eucalyptus Essential oil that is blended with the Mint Essential Oil, it’s a perfect balance. This is added to a base of Argan, JoJoba, Grapeseed and Sweet Almond carrier oils. The result is a beard oil that not only leaves your beard smelling fresh, but also keeps your beard and skin under the beard in tip-top condition. Argan oil is a thicker oil that I like in beard oils, it helps soften your beard hair and also gives some hold to your beard and it contains Vitamin A, Vitamin B1, Vitamin B2, Vitamin B6, Vitamin C, Vitamin E. Jojoba oil is one of the most useful oils as it is chemically similar to the oil secreted by our sebaceous glands and it helps to moisturise, nourish and protect. Grapeseed oil is absorbed very quickly and does not leave a greasy feeling, it is anti-inflammatory and helps reduce acne. Sweet Almond Oil’s main benefit is on the skin and is great for those who suffer from dry skin and bear itch,a beard oil is great for our skin as well as our beards, in fact maybe slightly more so. ‘Royal Mint’ Beard oil from Royal Beard Club left my beard feeling and looking good, then of course there is that fresh minty scent and there is nothing negative that I can say about this beard oil. Contained in either a 15ml/0.5fl oz bottle for $14.99 now on sale at $9.99 or a 30ml/1fl oz for $29.99 now on sale at $15.97 from the Royal Beard website. Royal Beard Club is a New York based company that sells beard oils, beard balms and brushes and combs to keep that beard looking great. Like many Beard care companies Royal Beard Club started out from a bearded guy who wanted to keep his beard looking and feeling good, however once you blend an oil that works this well, it’s not long before friends and friends of friends want to get their hands on some and from there grows a company that ends up very popular. This for me is the sign of a great company, the Beard care products that are made by large companies to just cash in on the beard care market are never as good as products from companies like Royal Beard Club. ← How I source products for review & avoiding bad products.